Release your inner rockstar or allow your friends the privilege of picking up an axe or pounding the skins with you to 40 mind bending rock and roll tracks! Unleash your creative juices in the Jam Mode where you can create your own music in a state of the art multi-track studio! This is the musical revolution the world has been waiting for. It is quite unfortunate that the company that essentially invented the music genre has produced such a poor title, but Rock Revolution just doesn’t have any redeeming qualities. 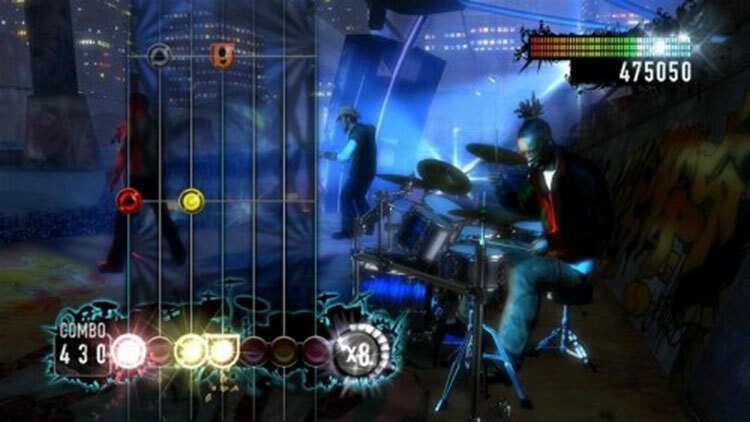 From the poor music selection to the bad visuals, this game doesn’t stand well on its own, and can’t even be considered good as a supplement to current music titles. I kept looking for something in Rock Revolution that would redeem it and justify its existence. It's $10 cheaper than the average 360 and PlayStation 3 release. But $50 is still probably $30 too much for a game that comes off as a low-budget title. 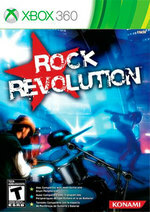 To summarize: Rock Revolution is inferior to its competition in every single possible way. 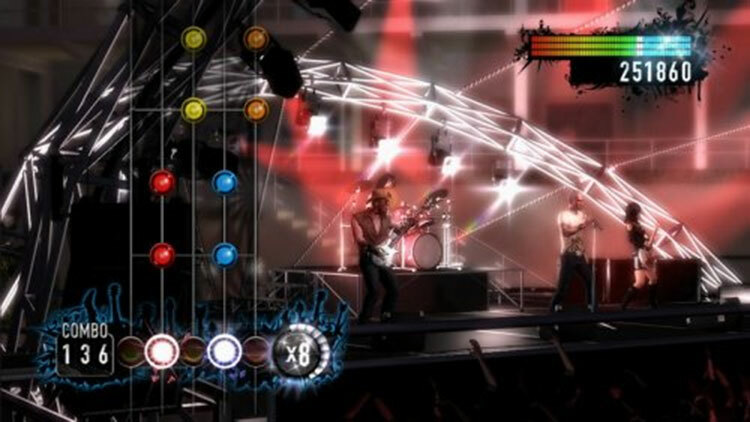 If you absolutely have to try it, we urge you to think of it as a track pack of guitar-only songs for Rock Band or Guitar Hero and buy just the game (instead of the drums-included bundle). The gameplay mechanics are rubbish, the progression system is limited and the multiplayer options are pathetic. There's nothing revolutionary about this game and there's certainly nothing "rock" about it. For 25 quid, you could hire Richard Blackwood and Daniel Bedingfield for the afternoon and still have change for an egg sandwich, a Panda Pops and the bus to Lewisham Travelodge. You'd have more fun. 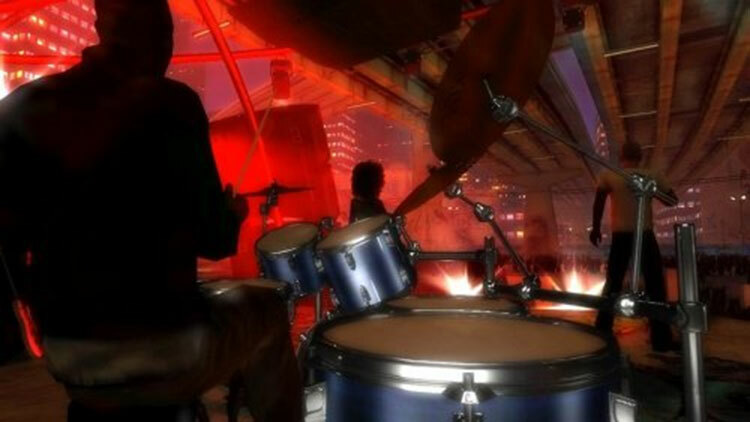 En los tiempos en los que estamos y con una competencia en el género musical tan completa como Guitar Hero o Rock Band repletos de canciones originales licenciadas, Rock Revolution se presenta como un videojuego correcto cuyo principal fallo radica en su escasa innovación y despliegue sonoro, este último una lista de canciones compuesta por versiones y no temas originales. Como decía Mick Jagger en (I Can't Get No) Satisfaction lo he intentado una, dos, tres, y hasta cuatro veces; solo y acompañado; con la mente abierta y el optimismo por bandera; pero nada... Rock Revolution no me trasmite nada, no me hace sentir como un rockero frustrado pero pletórico como sí consiguen Guitar Hero o Rock Band, me hace sentir como un jugador frustrado. Ni siquiera su precio reducido lo salvan. 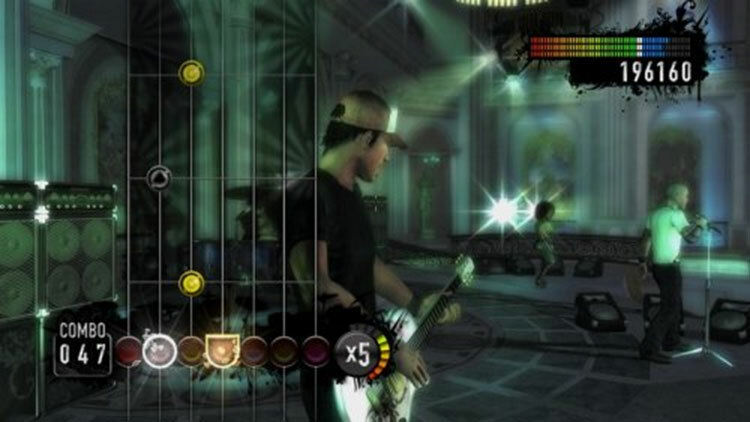 È inutile girarci intorno, Rock Revolution è un gioco pessimo che non si avvicina neanche lontanamente a due mostri sacri della categoria quali Rock Band e Guitar Hero. Il suo prezzo di vendita, nettamente inferiore alla concorrenza, è inoltre una chiara “ammissione di colpevolezza” che testimonia come gli sviluppatori fossero pienamente consapevoli di aver fatto un pessimo lavoro ancor prima di lanciarlo sul mercato.